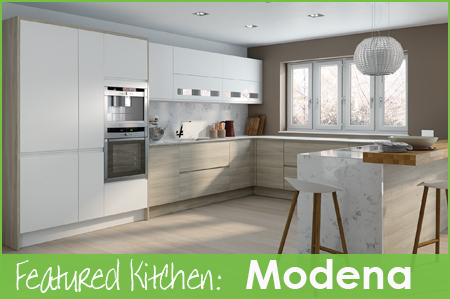 In the next of our Featured Kitchen posts we’re taking a closer look at the super sleek Modena kitchen. Modena, as the name suggests, is a very modern kitchen yet it retains the warmth and charm often more associated with a more contemporary design. The handle-less doors feature a ‘J’ profile which gives it elegance and creates a line inset through the kitchen as a design feature. The lovely letterbox glass door on wall cupboards compliment this perfectly and interior lights create a lovely effect at night. Modena boasts one of the widest ranges of colour choices which incorporates whites, creams, greys, greens and even charcoal black. Choose a single colour for maximum modernity or combine 2 for warmth and contrast. Who would choose a Modena kitchen? Modena would suit anyone looking for a modern kitchen that is still capable of looking warm and inviting. It’s a very practical design to keep clean with minimal areas for attracting dust and dirt so great for both the house proud and those looking to make their lives easier! The huge choice of colours mean that even the most particular person can find a colour they love. 0 Responses to "Featured Kitchen: Modena"